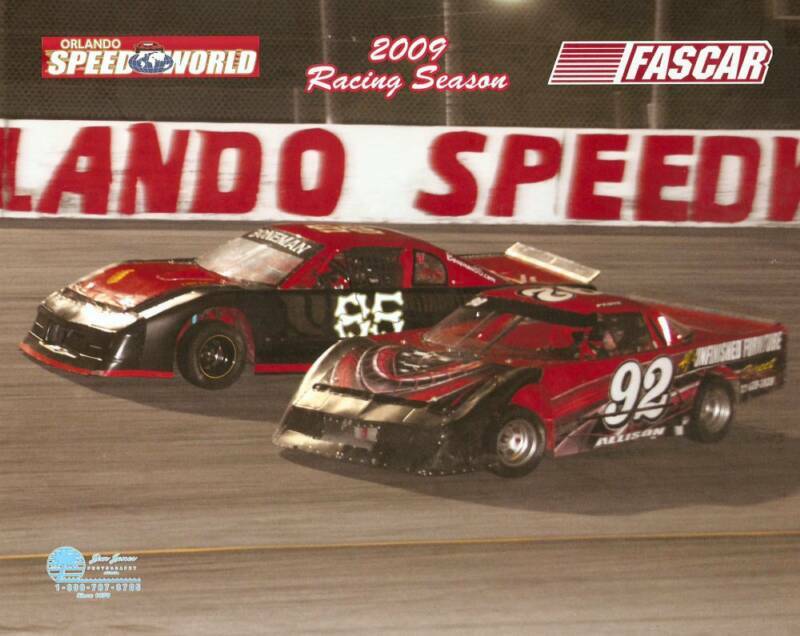 Orlando Speedworld doesn't open until March, so as usual, my year started out with a bunch of other racing activities like lots of spectating at Speedweeks/Winter Nationals events, and a little bit of driving too. Behold. 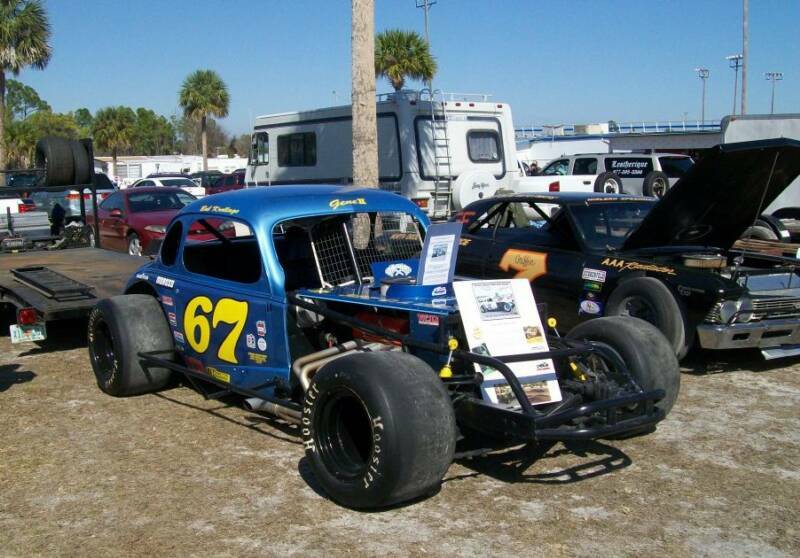 Matt Brown hooked me up with his Scrambler car for a night at Auburndale Speedway on Feb. 14. The track was having "organizational issues" and ended up cancelling our feature, so I only got to run a heat race! I've wanted to drive one of these since I was a kid! Vaughn Rockney gave me a chance to try out his Chevy II powered "Pogo" midget at the Zephyrhills antique racecar meet. Thanks! 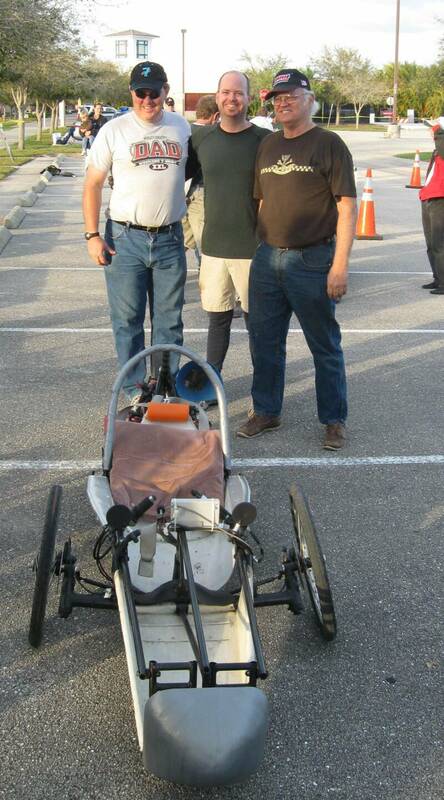 Our team won another Electrathon race on Feb. 21 at the "Battery Beach Burnout" on the F.A.U. campus in Jupiter. It was a neat day: they had lots of electric car events like our race and "scooter cross". 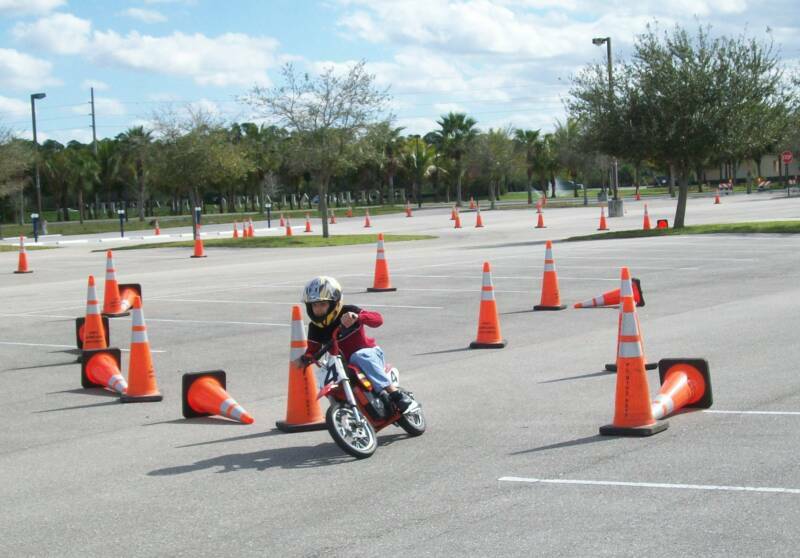 My son Michael is shown above competiting on his electric dirt bike. I even did a quick interview with Autoweek magazine. It was modified reunion time again! On Feb. 13, I spent the day assisting, but there was not much to do since things went so smoothly. No problem; I got to hang out and visit at the reunion all day, then more at the races all night! LIttle 500 night was back for the third year on Feb 28. We had a great turn-out; I bet there were 60 of us. Michael and I left at 1, and it the remaining group showed no signs of going home before sun-up! 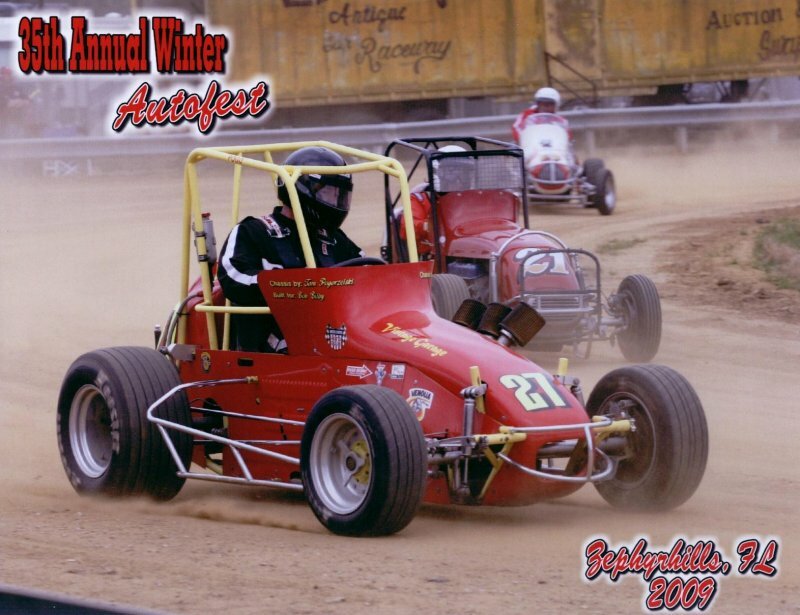 After driving the midget, I went to East Bay and sat in for an hour on "Real Racin' USA". They were broadcasting live from the restaurant at the track. Here is a link to the podcast of the show. CLICK HERE and look for the Feb. 19, 2009 edition. 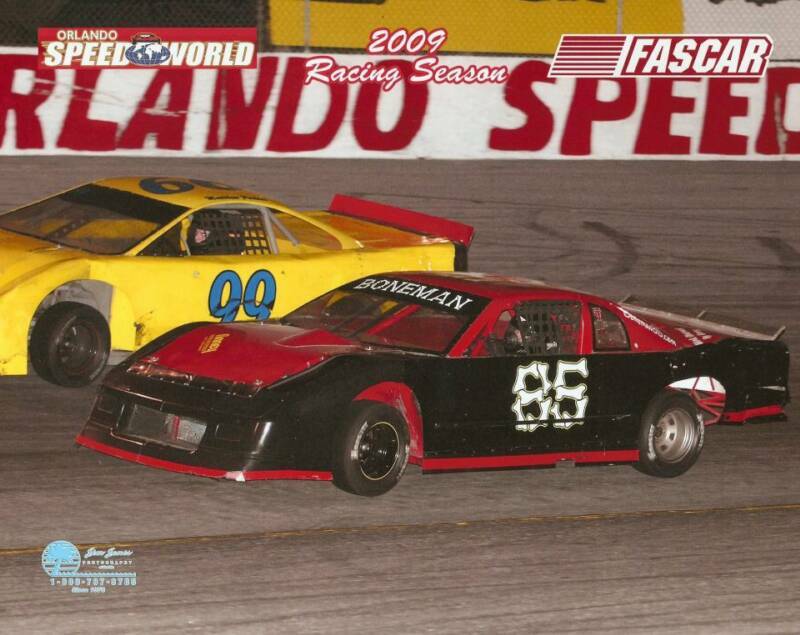 I had the chance to drive my buddy Ed's Sportsman car at Orlando on opening night of the season. 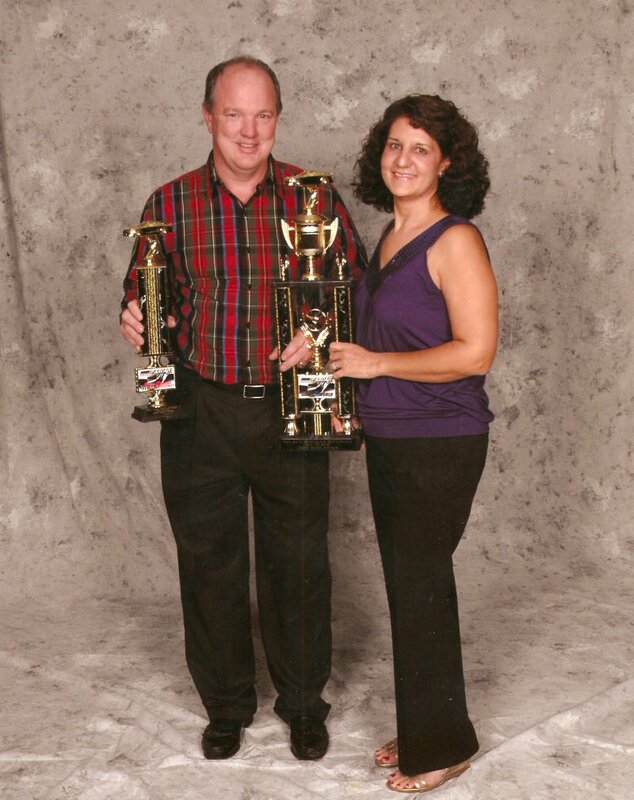 They should have held the "best appearing" car contest like they usually do. This car would have won it! I had a practice session, then ran the 25 lap feature. We ended up 4'th out of 11 cars. A fun night! So I knew it was going to be bad when I arrived at the track around 8:15. Our race was the second event that started around 8:20! I got my fire suit on while driving the truck, jumped in the car as soon as I got there, and made the start with 1 or 2 minutes to spare! I was running ok, but I had just put this motor in and it had an oil leak, so I pulled out. 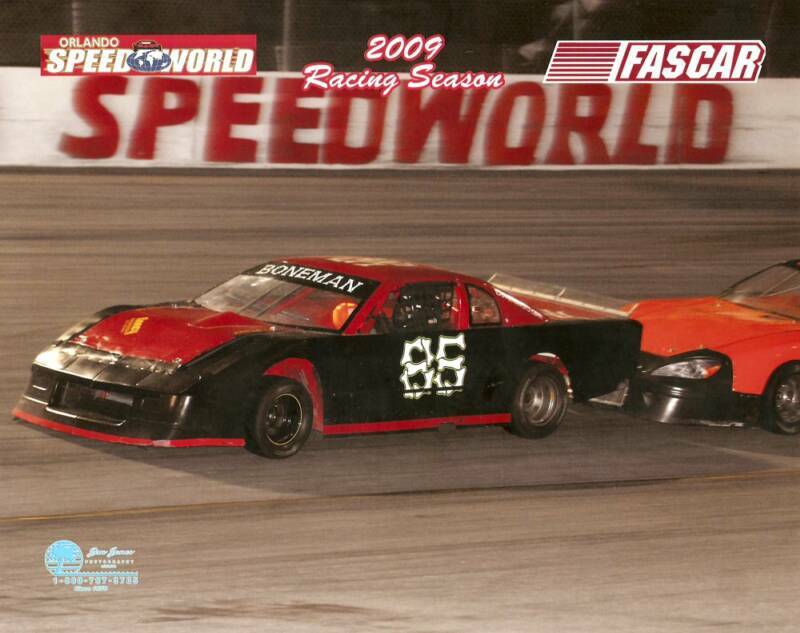 I made it back to Orlando Speedworld and run much better than last time. However, just past half-way, a problem developed in the distributor that put the engine way, way out of time. I got pretty slow at the end and finished a distant fifth. 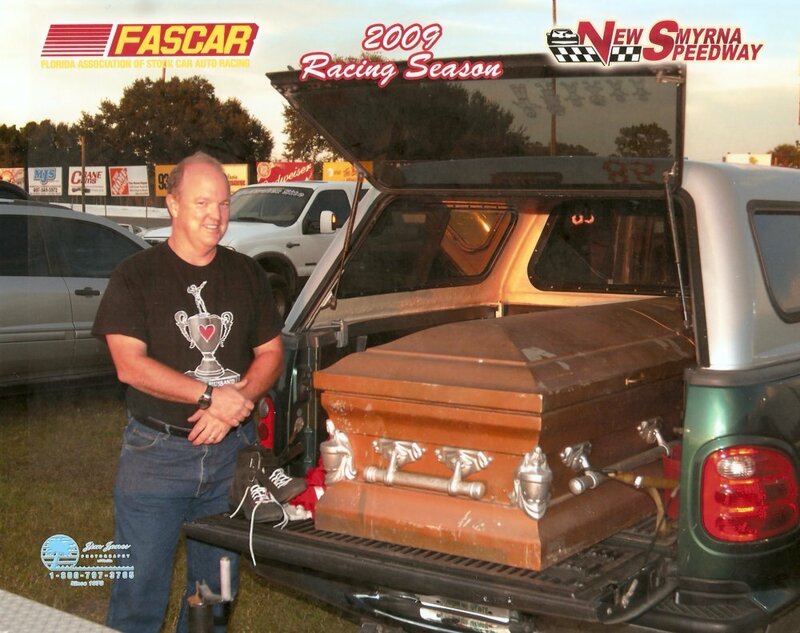 The picture at the left was taken during my first visit to New Smyrna in 2009. Everything worked pretty well; it was a fun and relaxing night. I ended up forth. 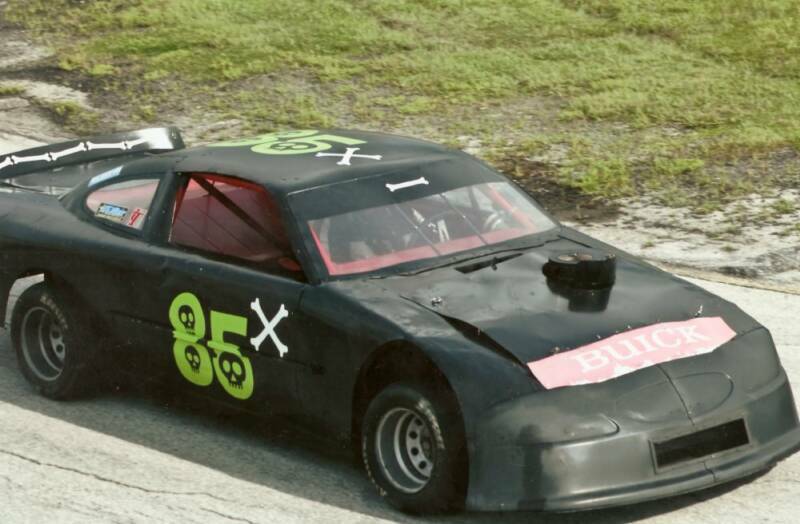 I took old 85X to Auburndale Speedway. I've driven there a little, but this was the first time I've taken my own car. What a fun night! I went pretty well in practice, but managed to slow down for the feature. There were 8 cars and I ended up 6'th! I had the new car at Orlando, and made it out for one session of practice, but a monsoon rolled in and rained out the show. Patty and I ended up going out to eat, and I had a blast visiting with a bunch of friends at the track, so it wasn't a total loss. Back to Auburndale for my second visit there. We were running a 50 lap feature, but it started raining on lap 19 and didn't quit for an hour. 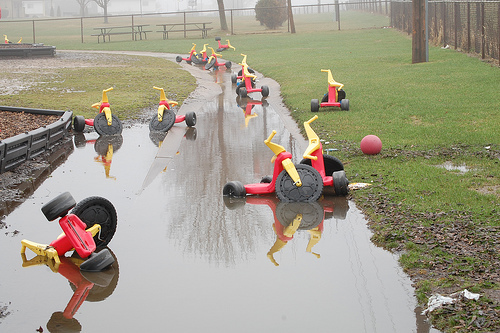 The race was thrown out and will be rescheduled one day. Oh well, I had a good time hanging out with Ed, Vaughn, Todd, Ron and who knows who else. 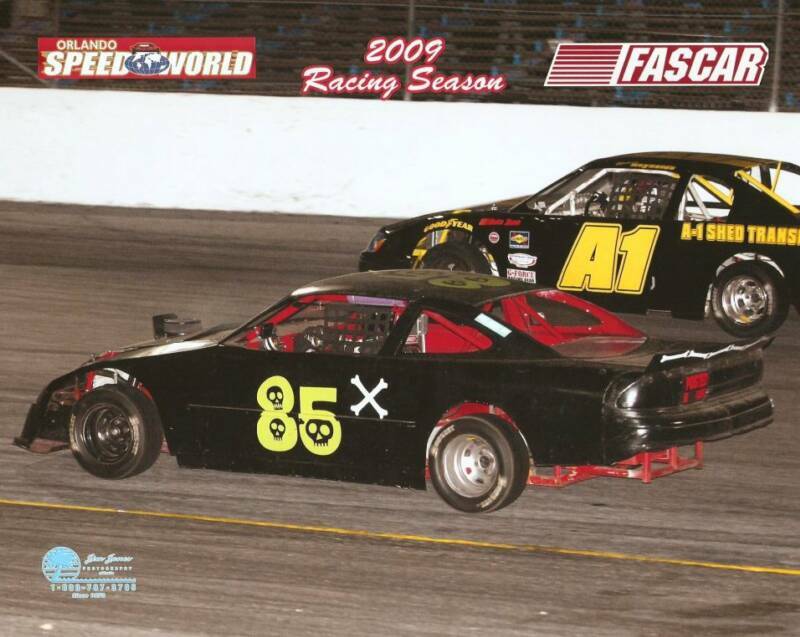 Speedworld has rained out over and over, so I finally got to race again at Auburndale. This track is really growing on me; its fun! I have not figured this place out yet, so I had a pretty bad finish: 8'th out of 13 cars. Overall, it as a blast. Michael came with me and provided pit area music, timing and tire assistance. 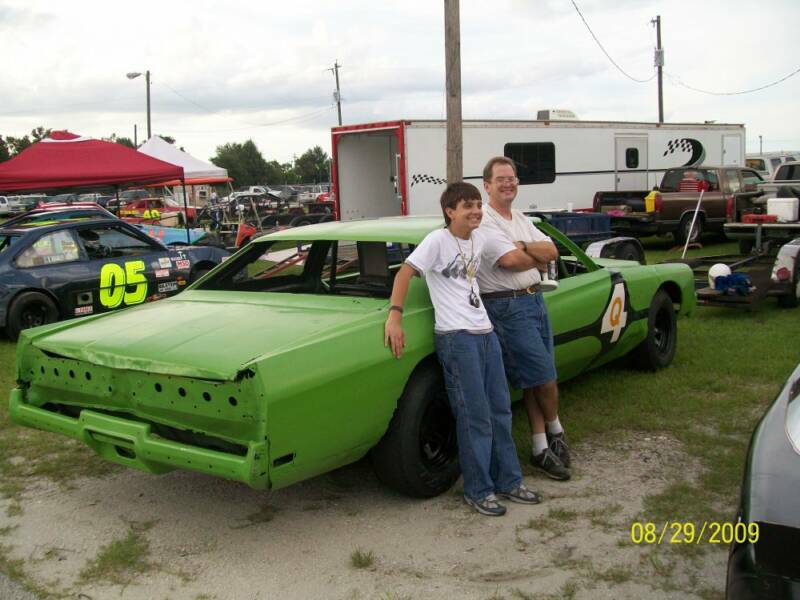 Here he is with Todd McCreary, and Ron's latest racing Electra. 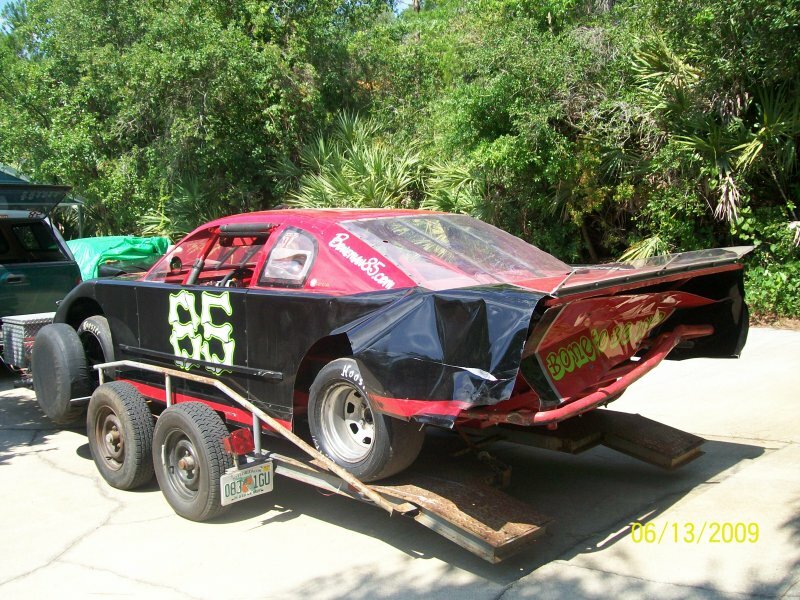 Speedworld has closed up for the next few weeks, so I brought the new car to New Smyrna. I went pretty well and finished third. It says "Bone to Be Wild" on the back of the car. I arrived at New Smyrna at 7:10. Unloaded 85 at 7:15. The rain began at 7:25. I loaded up in the rain at 7:30. 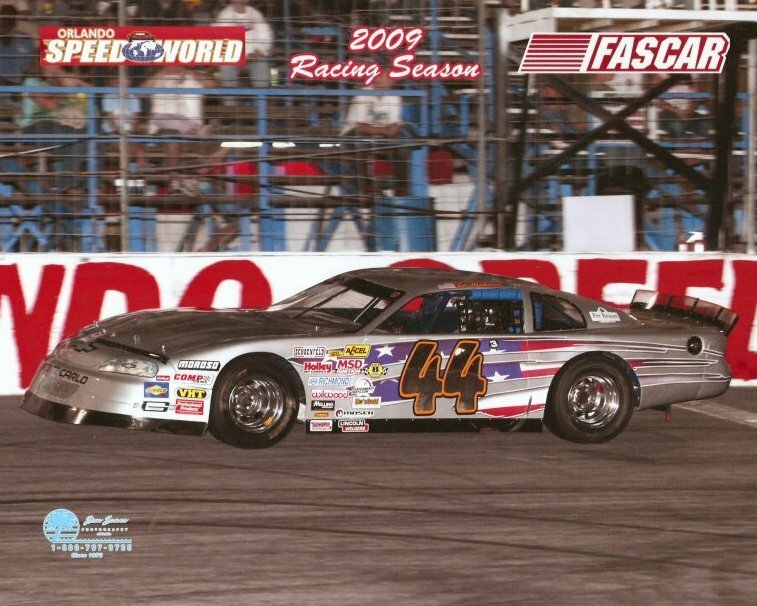 This was the first rain-out of the year at New Smyrna, but I've lost count of how many times its happened to me in 2009. This is the worst year for rain on race nights. 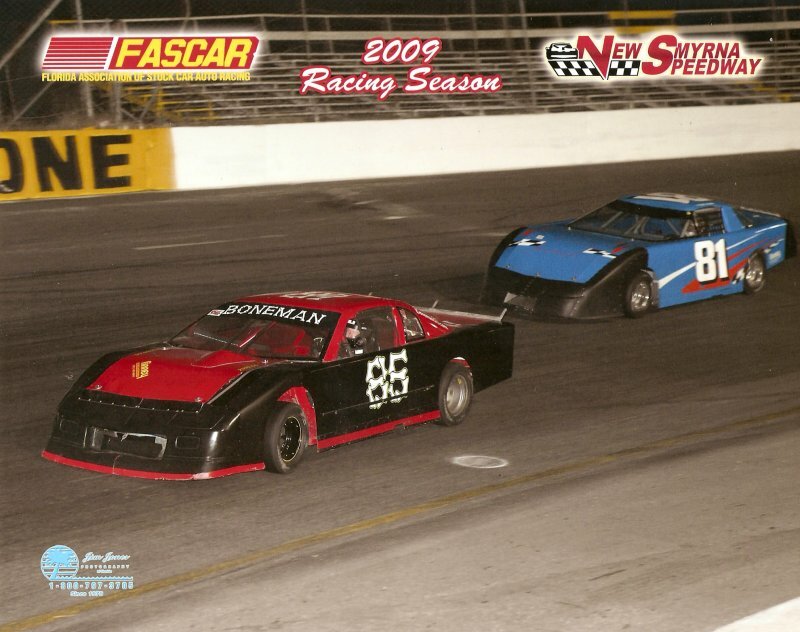 What a fun night at New Smyrna! 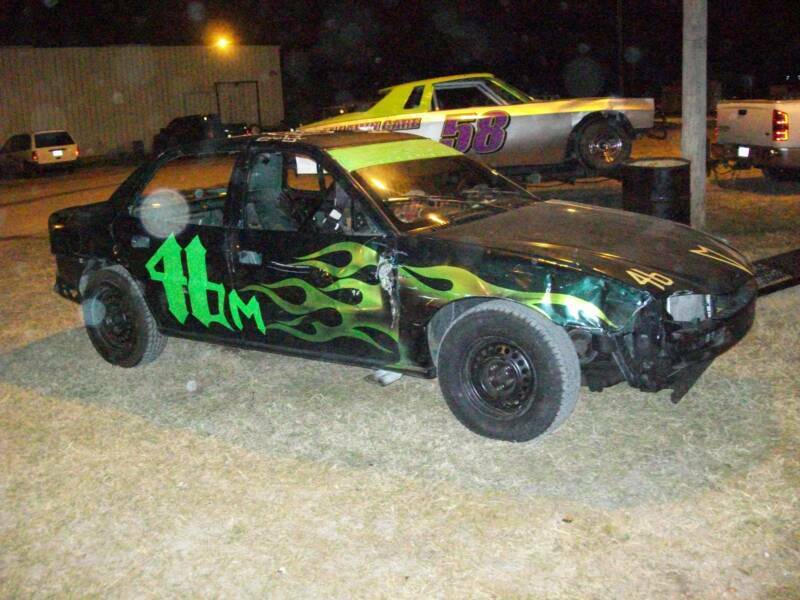 My car ran very well and I ended up third out of 14. I was happy with that finish because I was close to the winners after running a green flag stretch of 28 laps in our 30 lap feature race. I spotted for a friends Sportsman car, and had lots of time with nice people. The races were very good too! 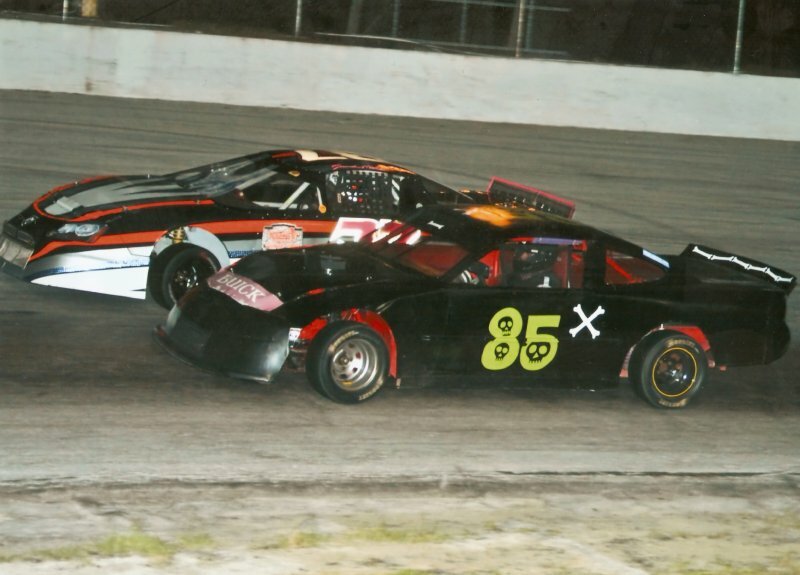 I made my first trip to Citrus County Speedway, and it was to run in a 100 lap race. It's tough to come into someone's backyard and run on their home track, but I got going pretty well by the second half of the race. 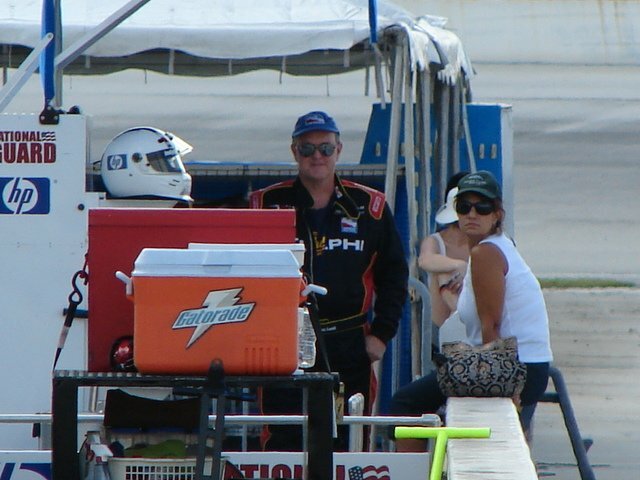 Todd McCreary came along and toiled in the heat with me....we had a great race night! Orlando Speedworld reopened after a 3 month disruption caused by persistent rains and track surface problems. I took the new car our and ended up 4'th, although I was pretty pleased with the way it ran. It was another highly social evening. 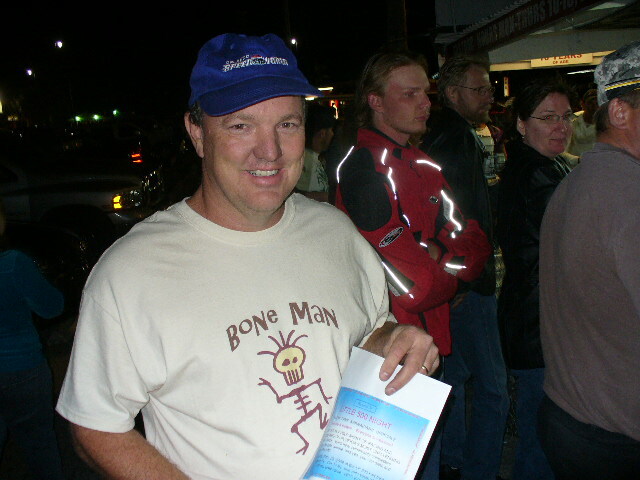 in fact, I couldn't work on my car very well because there were lots of friends hanging around my pits to visit. 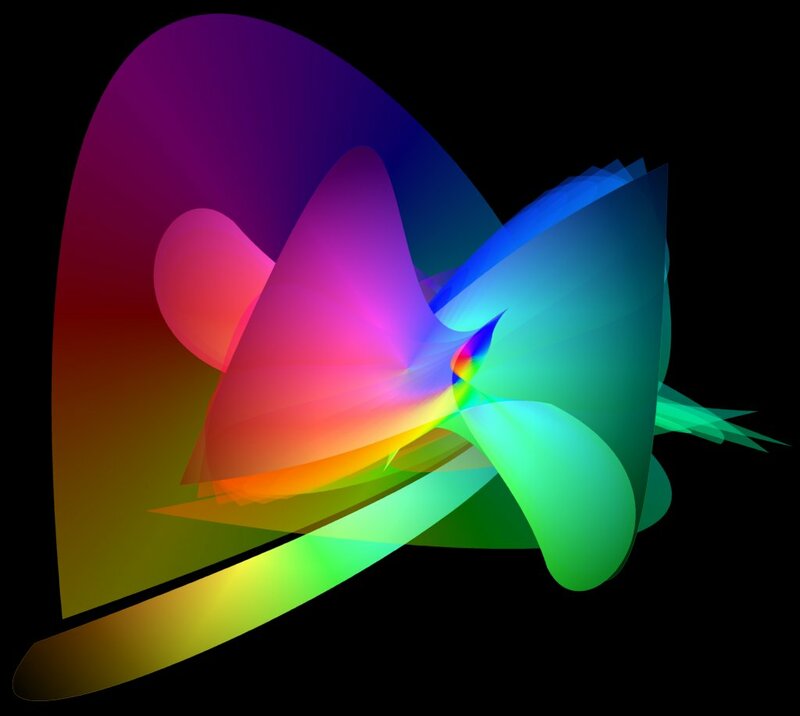 Its pretty cool! We it IHOP on the way home and carried on until 2 am. 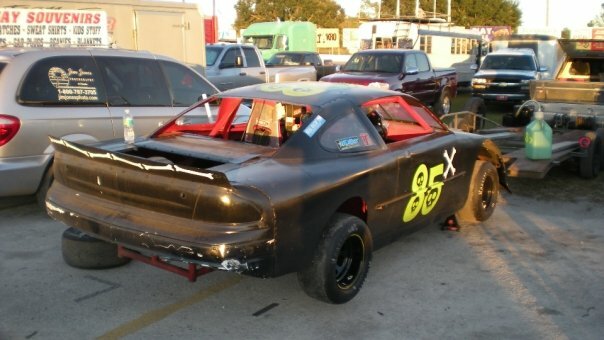 If you are counting, I've taken a car to the track 6 weeks in a row, and have raced at 4 different tracks! 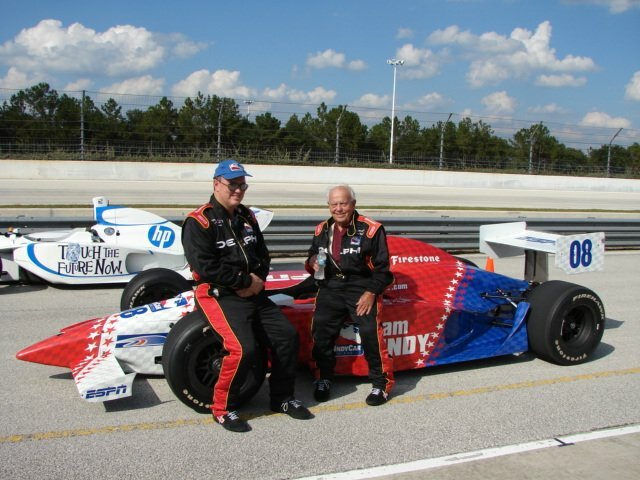 We had a day at the Indycar Driving Experience at the Disney Speedway. My dad and I each had about an 8 lap ride. 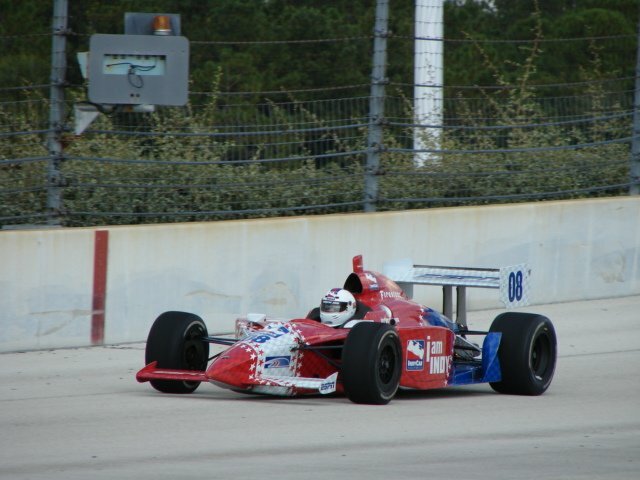 Yes, it was a real Indycar, although it didn't have an Indycar engine. We had to follow a pace car around, but it gradually got a little faster every lap. The employee who timed the session said I was going around 114 mph down the straight, although I doubt it. Still, it was fun to drive it through the corners on this 1.3 mile track. 7'th race week in a row! Back at Orlando, and I had a "near miss". 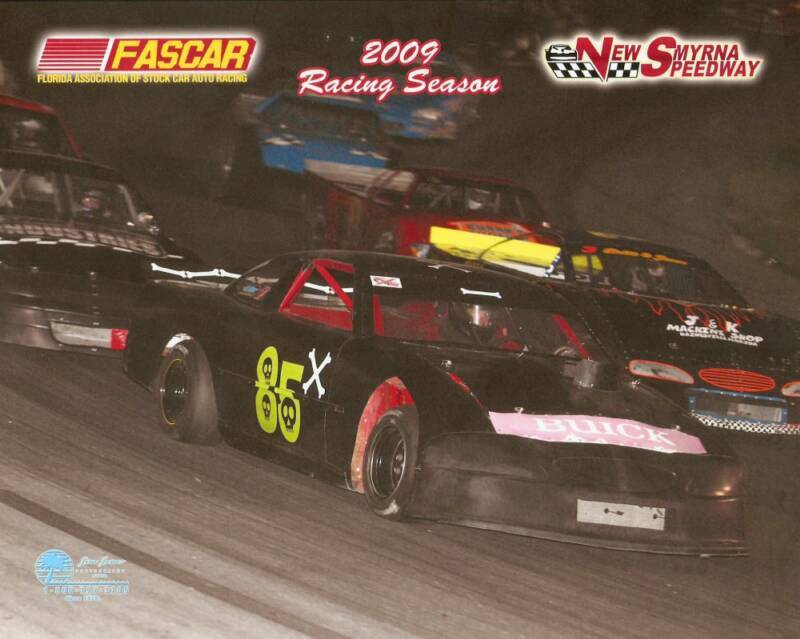 I led the feature for 15 laps, and had it under control, but the yellow came out. A few laps later, I ended up spinning while fighting it out in traffic. The starter sent me to the rear and I ended up 4'th...again. Michael was my crew tonight, and my wife brought my my younger sons to watch. 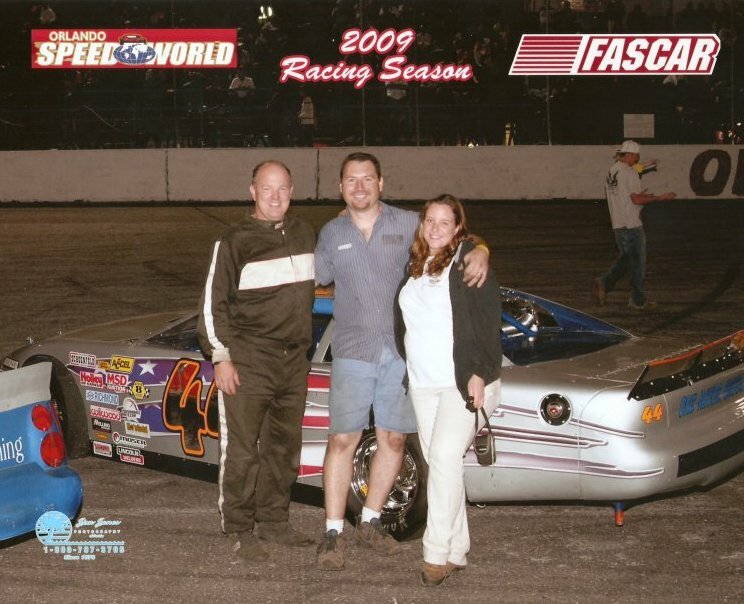 10-2-09 Todd McCreary in victory circle after the Strictly Stock race. 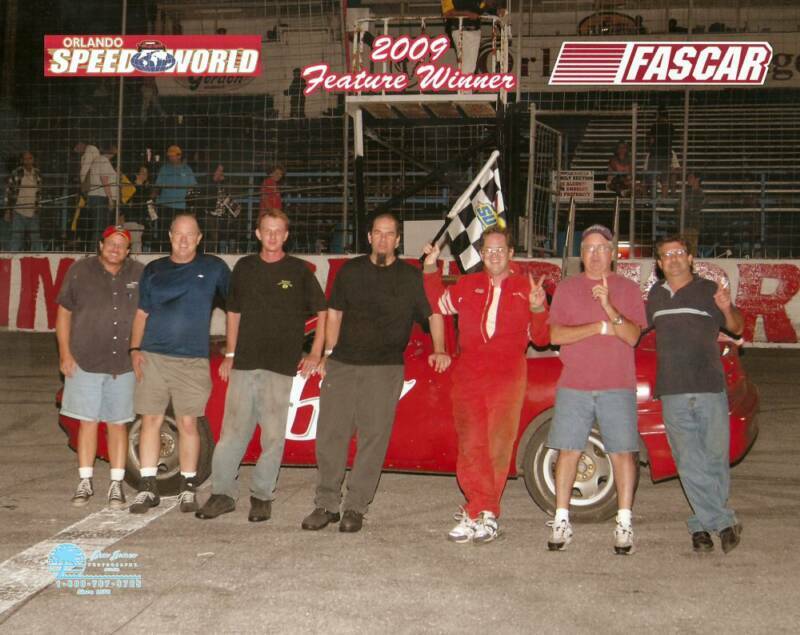 From left to right: Roger "AB195", me, Michael Seay, "Derf", T-mac, Mike Poole and Jerry "Frasson118" Binner. 8'th race week in a row. Orlando rained out, so I took 85X to New Smyrna. I had a busy week and was not fully prepared to race, but I figured "why not"? Anyway, we had 10 cars and I finished 5'th. The weather finally cooled way off, so it felt great to be outside....finally! Since it was Halloween season, I thought I'd bring my special "Halloween toolbox". 11-6-09 Ahhh... racing in cool weather....what a treat! I finished second at OSW tonight. It was a fun evening for sure; lots of friends around and some good racing too. 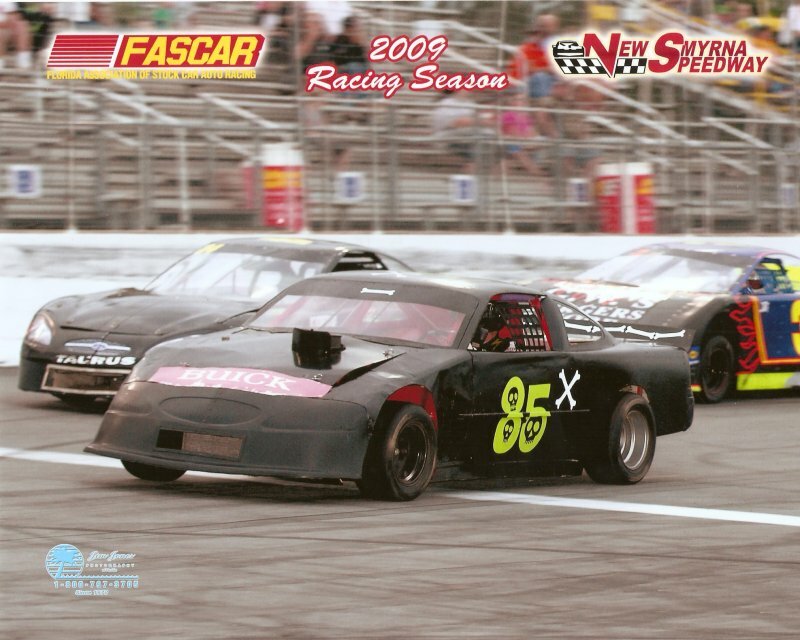 I led the feature in the beginning, but got passed. OSW, and for the second year in a row, the top two cars were in a dead heat. I started on the pole next to one of the contenders, and right in front of the other. I ended up second after a close, hard race. 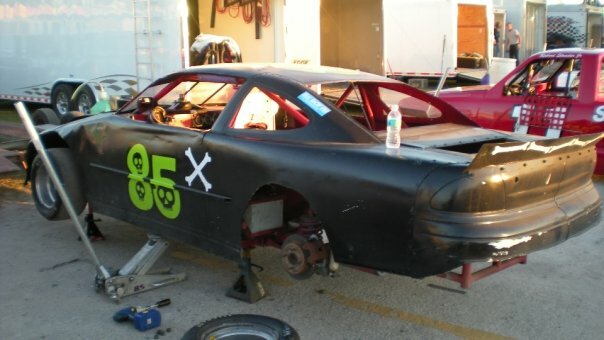 I took the old car to New Smyrna to run a 50 lapper. Out of 20 cars, I qualified 4'th and finished 6'th. It was fun! 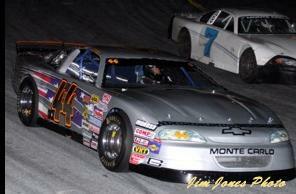 After a big wreck at the start, we went 40+ laps under green. 85X is in for some cosmetic surgery. 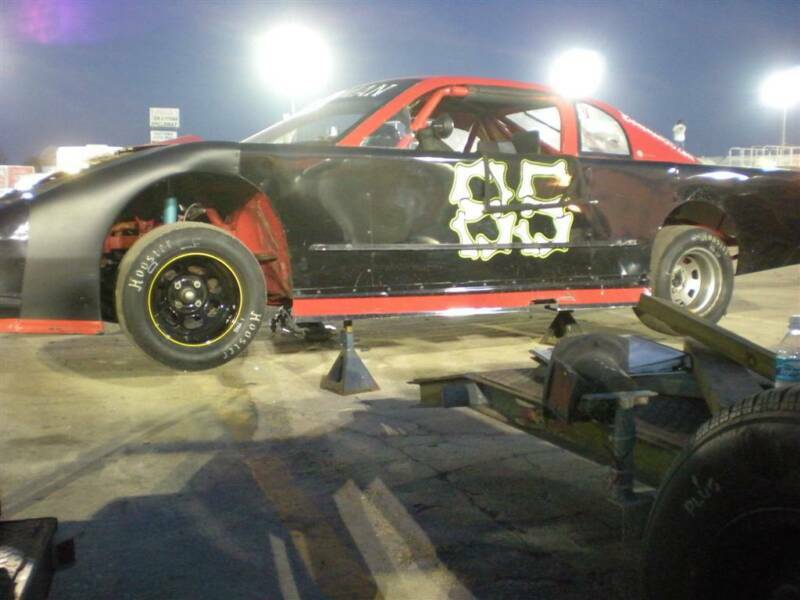 It will get some updates during the off-season: some new body work, maybe a new paint job?? 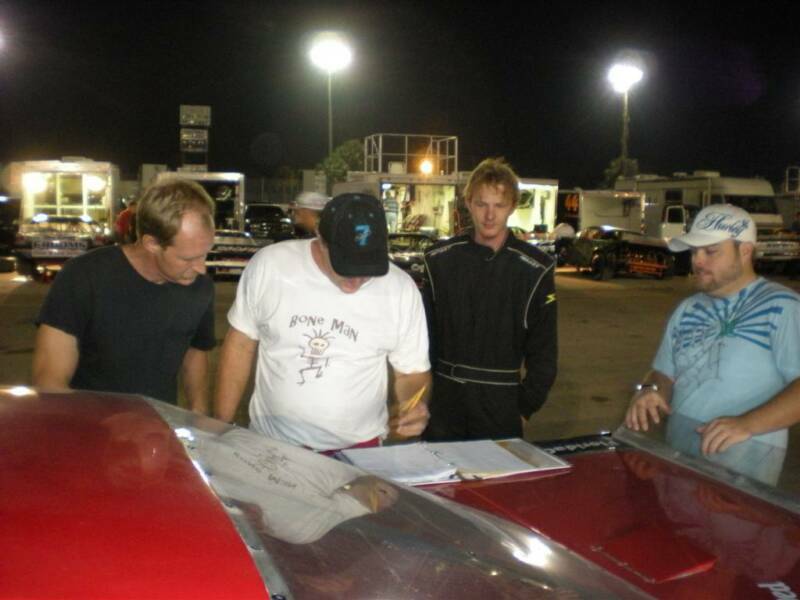 It is the Governor's Cup weekend at New Smyrna, and my class finished up the year on a Friday night. I led the feature for a few laps, but had settled into second. 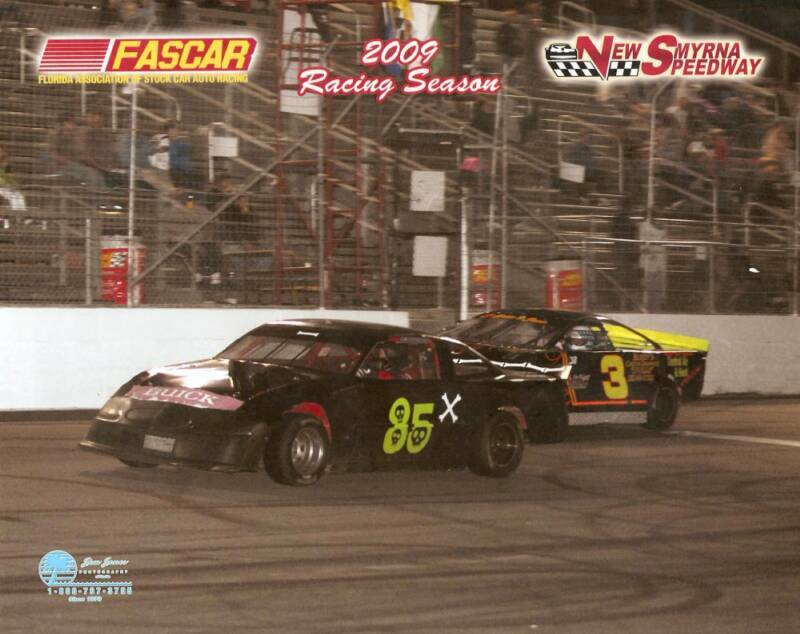 Then I lost a few spots on a restart, and ended up third by the time the flag fell. 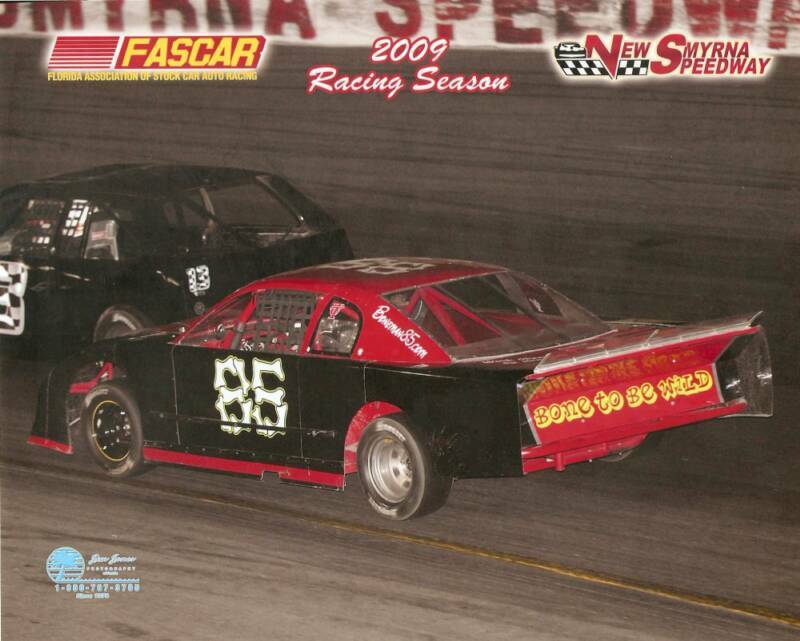 This finish put me 7'th at the end of the season point standings. Combined with my 4'th at OSW, this is the first year I've ever been in the top 10 at two tracks. So that does it for 2009! 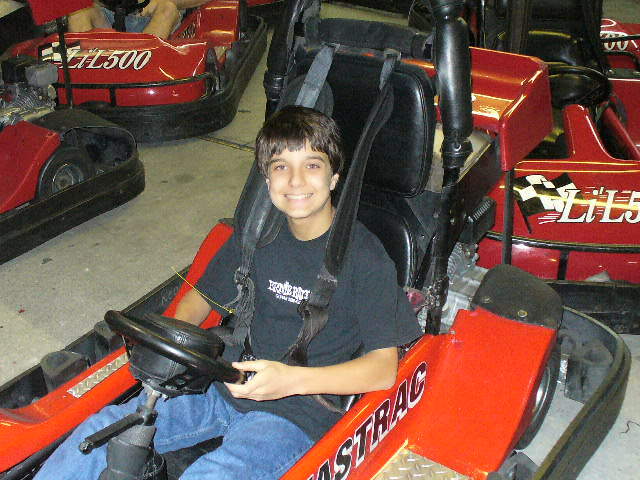 I had 21 race nights and 6 different tracks, and in 5 cars, plus a chance to drive around in an Indy car. No wins this year, but at least I got close a few times. Best of all, there were no major mechanical issues and only one minor crash. 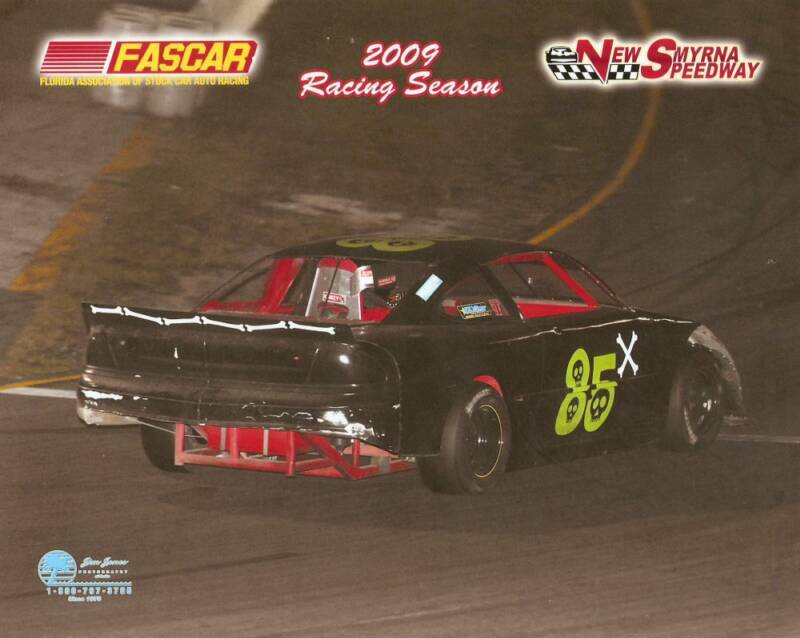 I got to race on 3 tracks for the first time: Citrus, Zephyrhills and Disney Speedway. I ended up with 56 nights at the track this year, and enjoyed them all!